LAS VEGAS -- The floor-to-ceiling windows inside the Phillies’ high-rise corner suite offer a picturesque view of the towering casinos and the sprawling mountains that sit in the distance. The gambling mecca - constructed in the middle of a desert - was built on the backs of the wide-eyed who came to Las Vegas hoping to hit big on a chance and went home defeated. It is the gambler’s risk that Phillies general manager Matt Klentak must weigh this week at the winter meetings as his pursuit of Manny Machado and Bryce Harper truly begins. The Phillies expect to meet this week with both Harper’s agent, Scott Boras, and Machado’s agent, Dan Lozano. The chase is on. The agents will visit the Phillies’ suite seeking 10-year deals and historic paydays for their clients. Harper and Machado are in-their-prime superstars. They are just 26 years old and it is all but certain that their best years are ahead of them. The immediate winnings are obvious. But as the Phillies meet with the agents in their suite, Klentak can gaze out the window and be reminded of the risks. The market for Harper may have slimmed this week as Nationals owner Mark Lerner said on Friday that he does not expect Harper to return and Yankees general manager Brian Cashman told reporters Monday that there is no room for him in the team’s outfield. The Phillies seem to be moving into great position, but Klentak left no hints. “I’m not going to telegraph our intentions here,” he said. As the Phillies continue to chase Harper and Machado, they will also push heavily for a starting pitcher. Klentak reiterated his wishes Monday to add a lefthander. It remains unlikely that the team would be willing to offer Dallas Keuchel a long-term deal, but J.A. Happ is a reasonable target. Happ has an affection for Philadelphia, the city where he began his career, and would be brought in on a short-term contract. He could be signed before Thursday. Klentak may not like 10-year contracts, but that should not be enough to keep him away from the superstars. 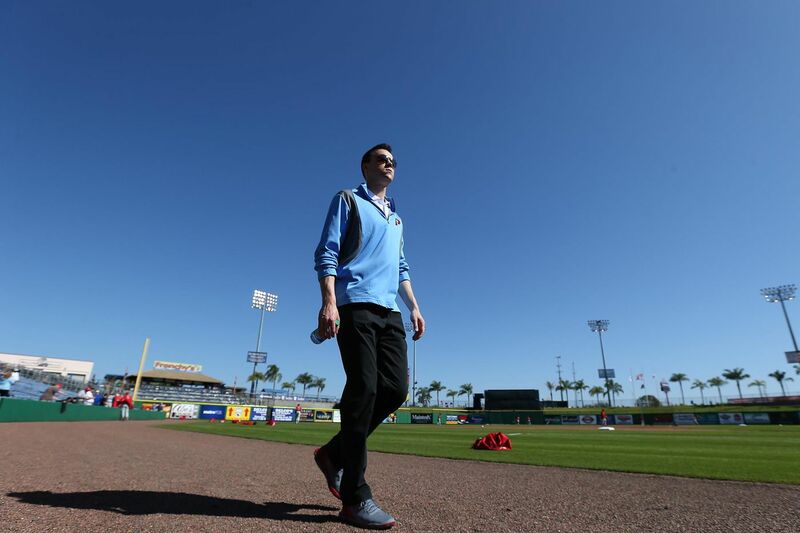 He has long stated his dislike of signing pitchers to long-term deals, “yet a week ago we were bidding pretty aggressively on a long-term starting pitcher,” Klentak said in reference to the team’s pursuit of Patrick Corbin. Harper and Machado will not be the same players at 26 that they are at 36 when a 10-year contract ends. The gamble is if the first-half of the contract -- the production Harper and Machado can make before turning 32 -- can outweigh whatever happens in the later stages. It’s up to Klentak to decide. And he would not have that beautiful view of Las Vegas if someone else hadn’t been willing to take a chance.